1. 5 years ago, the age of the father is 3 times the age of his son. 7 years hence, the age of the father and his son is in the ratio of 9: 4. The average Present age of the father, mother, son and daughter is 40. The difference between the age of the mother and her daughter is 34. Then find the present age of the daughter? 2. P, Q and R started a business by investing in the ratio of 6: 8: 7. After 5 months, P withdraws Rs. 4000 and after another 2 months, R invested Rs. 2000 more. If the share of P, Q and R is in the ratio of 130: 192: 173, then find the initial investment of R? 3. The shopkeeper gives 20 % discount on the marked price for selling an article. If the cost price of the article is increased by 10 %, then the profit becomes half while comparing with the original profit. The marked price of the article is Rs. 600. Find the cost price of the article? 4. Three pipes A, B and C can fill a tank in 12 hours. After working at it together for 4 hours, C is closed and A and B can fill the remaining part in 12 hours. How much time taken by C to fill the tank alone? Three pipes A, B and C can fill a tank in 12 hours. C can fill the tank in 36 hours. 5. 18 men can complete a piece of work in 10 days. After 4 days from the start of the work, some men left. If the remaining work was completed by the remaining men in 9 days, then how many men left after 4 days from the start of the work? After 4 days from the start of the work, 6 men left the job. Directions (Q. 6 – 10) Study the following information carefully and answer the given questions. 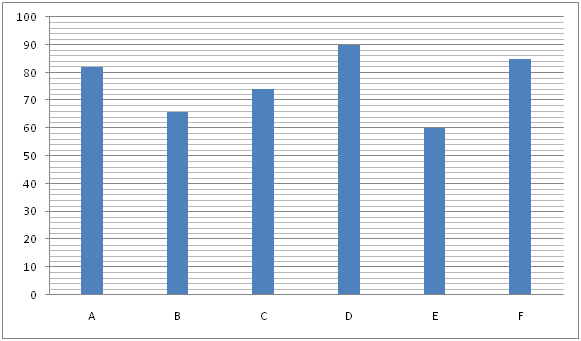 The following bar graph 1 shows the total investment (In thousands) of Moni and Priya in 6 different schemes (A, B, C, D, E and F) The following table shows the percentage of total investment of Moni in 6 different schemes (A, B, C, D, E and F) out of the total investment of Moni and Priya in the same schemes. 6. If scheme C offers simple interest at a certain rate of interest and the difference between the interest earned by Moni and Priya from scheme C after 3 years is Rs. 3552, then find the rate of interest per annum? 7. Scheme A offers compound interest compounded annually at 15 % per annum. Find the sum of the interests earned by Moni and Priya after 2 years in Scheme A? 8. The amount invested by Moni in Scheme E is equal to the amount invested by her in Scheme P. The rate of interest for both the schemes is same. Scheme E offers compound interest and Scheme P offers simple interest. If the total interest earned by Moni in Scheme E and P together after 2 years is Rs. 11808, then find the rate of interest per annum? 9. Find the average interest earned by Moni and Priya in Scheme D and Scheme B respectively after one year, if Scheme D offers compound interest (Compounded half yearly) at the rate of 12 % per annum and Scheme B offers simple interest at the rate of 15 % per annum? 10. Find the ratio between the amounts invested by Moni in scheme A, C and D together to that of the amount invested by Priya in Scheme B, E and F together? 1) 5 years ago, the age of the father is 3 times the age of his son. 7 years hence, the age of the father and his son is in the ratio of 9: 4. The average Present age of the father, mother, son and daughter is 40. The difference between the age of the mother and her daughter is 34. Then find the present age of the daughter? 2) P, Q and R started a business by investing in the ratio of 6: 8: 7. After 5 months, P withdraws Rs. 4000 and after another 2 months, R invested Rs. 2000 more. If the share of P, Q and R is in the ratio of 130: 192: 173, then find the initial investment of R? 3) The shopkeeper gives 20 % discount on the marked price for selling an article. If the cost price of the article is increased by 10 %, then the profit becomes half while comparing with the original profit. The marked price of the article is Rs. 600. Find the cost price of the article? 4) Three pipes A, B and C can fill a tank in 12 hours. After working at it together for 4 hours, C is closed and A and B can fill the remaining part in 12 hours. How much time taken by C to fill the tank alone? 5) 18 men can complete a piece of work in 10 days. After 4 days from the start of the work, some men left. If the remaining work was completed by the remaining men in 9 days, then how many men left after 4 days from the start of the work? 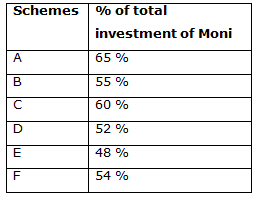 The following table shows the percentage of total investment of Moni in 6 different schemes (A, B, C, D, E and F) out of the total investment of Moni and Priya in the same schemes. 6) If scheme C offers simple interest at a certain rate of interest and the difference between the interest earned by Moni and Priya from scheme C after 3 years is Rs. 3552, then find the rate of interest per annum? 7) Scheme A offers compound interest compounded annually at 15 % per annum. Find the sum of the interests earned by Moni and Priya after 2 years in Scheme A? 8) The amount invested by Moni in Scheme E is equal to the amount invested by her in Scheme P. The rate of interest for both the schemes is same. Scheme E offers compound interest and Scheme P offers simple interest. If the total interest earned by Moni in Scheme E and P together after 2 years is Rs. 11808, then find the rate of interest per annum? 9) Find the average interest earned by Moni and Priya in Scheme D and Scheme B respectively after one year, if Scheme D offers compound interest (Compounded half yearly) at the rate of 12 % per annum and Scheme B offers simple interest at the rate of 15 % per annum? 10) Find the ratio between the amounts invested by Moni in scheme A, C and D together to that of the amount invested by Priya in Scheme B, E and F together?